In a paper recently published in Nature Medicine, Zacharakis et al. report the case of a 49-year-old woman with estrogen receptor (ER)-positive, HER2-negative metastatic breast cancer, refractory to multiple lines of chemotherapy, who was enrolled in a phase II clinical trial that evaluated the efficacy of autologous tumor-infiltrating lymphocytes (TILs) in reducing tumor burden in metastatic epithelial cancers. Selection of TIL subpopulations reactive against tumor-specific neoepitopes may have dramatically improved efficacy in this low-mutation-rate tumor type. Zacharakis et al. performed whole-exome sequencing and RNA-seq on one of the lesions and found 62 nonsynonymous somatic mutations. To determine which of these mutations yielded antigenic peptides, the team cultured TILs with high-dose IL-2 and screened them for reactivity using pulsed peptide pools or transfected mRNA of tandem minigenes expressed in autologous antigen-presenting cells (APCs). The screening revealed three neoantigen-reactive TIL fragments, with CD4+ TILs recognizing mutant SLC3A2 protein and CD8+ TILs reactive against mutant KIAA0368 protein. In order to isolate neoantigen-reactive T cell clonotypes, the team sorted reactive TILs by TCR-β variable region (TRBV) allotypes or high expression of the 4-1BB activation marker and performed TCR-focused deep sequencing. This led to the identification of seven TCR clonotypes that recognized SLC3A2 and one TCR that recognized KIAA0368. Following the identification of neoepitope-specific TCRs, the patient was treated with a total of 8.2x1010 TILs from the three neoantigen-positive TIL fragments administered in 7 doses every 8 hours. Prior to TIL infusion, the patient underwent nonmyeloablative lymphodepletion via chemotherapy (cyclophosphamide and fludarabine) and a single infusion of pembrolizumab (anti-PD-1). Pembrolizumab was also administered 3, 6, and 9 weeks after TIL infusion. TILs consisted of 62.5% CD4+ T cells with an effector memory phenotype and 33% CD8+ T cells. About 21% of TILs expressed PD-1 at the time of infusion. Six weeks after TIL infusion, target tumor lesions shrunk by 51%. Even more remarkably, at the most recent evaluation, 22 months after cell transfer, the patient achieved a complete radiographic resolution of all target and nontarget lesions. The researchers had originally added pembrolizumab to TIL treatment in order to prevent T cell exhaustion in the tumor microenvironment. Having achieved tumor regression, they retrospectively assessed the role that anti-PD-1 may have had on the success of the therapy. They analyzed two tumor samples obtained prior to cell transfer and found no PD-L1 expression in tumor cells of either lesion, while PD-L1 was expressed in the stromal cells of one tumor sample. PD-1 expression on peripheral blood T cells remained relatively constant over the course of 2 years. Based on this data the authors suspect that pembrolizumab did not play a significant role in antitumor response. 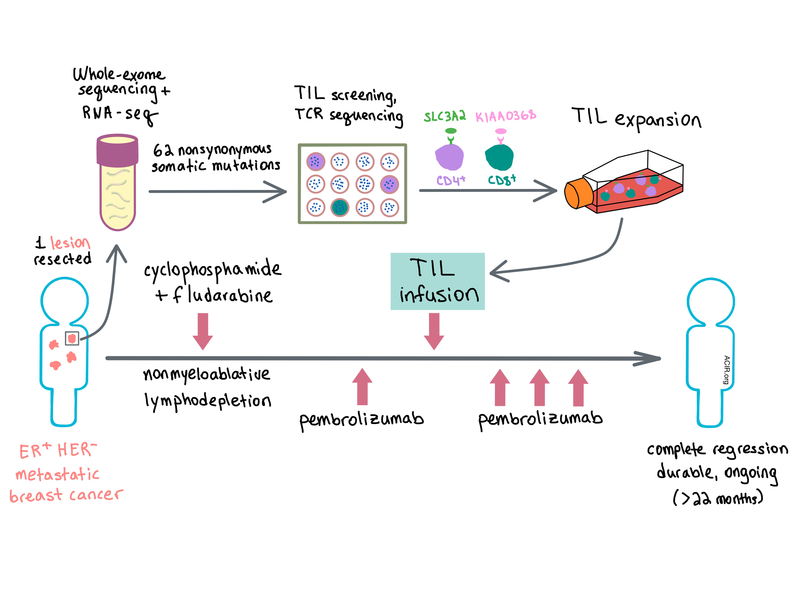 The team analyzed the clonotypes of infused TILs and peripheral blood T cells and found that the eight originally identified reactive TCRs, constituting 23% of TRBV sequences at the time of transfer, were present at about 2% in peripheral blood 6 weeks after transfer. Additionally, the researchers identified two other TRBV families that expanded significantly in the blood after treatment and contained at least one dominant TCR clonotype. Further analysis revealed a CD8+ T cell clone recognizing mutant CADPS2 protein and two CD4+ T cell clones reactive against mutant CTSB protein. Of the 11 total neoantigen-reactive TCRs identified, eight persisted in peripheral blood for at least 17 months after treatment. Overall, Zacharakis et al. show in a single patient that autologous TIL transfer can be highly effective in a tumor with a relatively low mutational burden when the TILs are enriched for neoantigen-reactive T cells that target multiple tumor antigens to prevent immune escape, further opening the door to personalized TIL or TCR therapies. Zacharakis N., Chinnasamy H., Black M., Xu H., Lu Y.C., Zheng Z., Pasetto A., Langhan M., Shelton T., Prickett T., Gartner J., Jia L., Trebska-McGowan K., Somerville R.P., Robbins P.F., Rosenberg S.A., Goff S.L., Feldman S.A. Immune recognition of somatic mutations leading to complete durable regression in metastatic breast cancer. NatMed. 2018 Jun. Using cell conjugation and proximity assays, Chaudhri and Xiao et al. demonstrate that PD-L1 binds PD-1 in trans (when they are on different cells), but only binds B7-1 in cis (when they are on the same cell). Binding of soluble B7-1 was only possible when membrane- or plate- anchored PD-L1 was flexible enough to allow interaction with B7-1 in parallel orientation. PD-1 and B7-1 compete with each other for binding PD-L1, and anti-PD-L1 antibodies block binding by both receptors. Tumor-infiltrating myeloid cells in mice with colon carcinoma coexpressed PD-L1 and B7-1, hinting at a biological significance of their interaction. Given that tumor endothelial marker 8 (TEM8) is expressed on the stroma of many solid tumors, Szot et al. combined MMAE (a microtubule-disrupting drug) with an anti-TEM8 antibody as an antibody-drug conjugate (ADC). The ADC was endocytosed by TEM8+ stromal cells, where the MMAE was cleaved from the antibody and released into the tumor, leading to bystander killing of primary and metastatic tumors and increased survival in mice. Stromal cells were resistant to MMAE due to high expression of P-glycoprotein, which exported the drug from the cells and served as a biomarker for sensitive tumor cells. The ADC was generally well tolerated. To overcome the lack of a specific targetable antigen in acute myeloid leukemia (AML), Kim et al. turned CD33 (expressed on normal and cancerous myeloid cells) into a targetable antigen for AML by genetically knocking out CD33 on human hematopoietic stem and progenitor cells (HSPCs). Engraftment of the CD33- HSPCs into mice and non-human primates showed normal myeloid function and long-term multilineage survival with no measurable off-target effects. In mice, treatment of AML with CD33-targeted CAR T cells eliminated the leukemic cells while preserving HSPC-driven myeloid cells, allowing for elimination of AML without myelotoxicity. In the modern treatment landscape of metastatic melanoma, patients are often refractory to first line checkpoint blockades. Forget et al. found that patients who recurred following checkpoint blockade were less likely to respond to adoptive transfer of TILs, had shorter durations of response and shorter overall survival. Previously known biomarkers of response to TILs (BTLA expression, infusion of high number of TILs, and infusion of a high portion of CD8+ TILs) were no longer valid in checkpoint blockade-refractory patients. Baseline serum level of IL-9 was identified as a biomarker of response irrespective of prior exposure to checkpoint blockade. In this review of Foxp3+ T regulatory cells (Tregs), Ethan Sevach offers insights into the past and current landscape of research on Tregs, and the significant gaps that still exist: the mechanism(s) by which Tregs suppress other immune cells; a reliable in vitro assay to adequately measure in vivo Treg suppressive function; the lack of specific, targetable surface molecules; and where and how Tregs are generated. A better understanding of Tregs would allow us to better manipulate them in the context of immunotherapy. This review is written in memoriam of William E. Paul. Blockade of receptor activator of NF-κB ligand (RANKL) enhanced the antitumor efficacy of PD-1 blockade and combination PD-1 and CTLA-4 blockade. Double and triple combination therapies controlled growth of multiple subcutaneous tumors (dependent on T cells and IFNγ) and decreased the frequency of lung metastases in mice with B16F10 melanoma or RM-1 prostate cancer (dependent on NK cells and IFNγ). Triple therapy enhanced the Th1 cytokine polyfunctionality of T cells. Relative to checkpoint blockade, concurrent or delayed RANKL blockade was most effective.